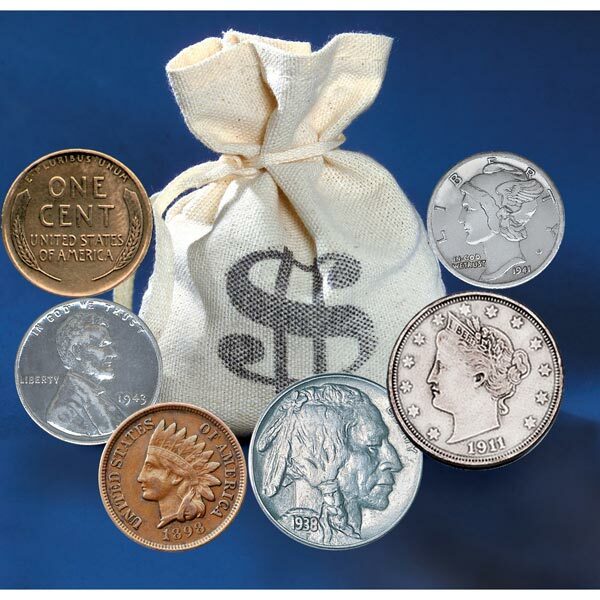 Open your Bankers Bag and discover lots of Pure Copper Wheat Ear Pennies, Steel Pennies, a Silver Mercury Dime, Buffalo Nickels, Liberty Nickels and more! Your Bankers Bag is guaranteed to include one coin dated from the 1800s. Perhaps a legendary Indian Head Penny, a Silver Jefferson Wartime Nickel, or possibly both will roll out as you spill over 60 historic coins from the canvas bag! Who knows what you'll find? Includes a Certificate of Authenticity. Allow 1-2 weeks for delivery. Item can only be shipped within the Continental US.